For kids, Memorial Day weekend means the start of summer. For me, the start of summer meant the chance to go away to camp – Camp Jitterbug, that is, in Seattle. If you’ve never traveled for a Lindy event – well, I highly recommend that you do. Immerse yourself in a weekend’s worth of live music, world-class instruction, and tired feet. But though I’ve danced in my fair share of different states, this workshop was different. I hopped on a plane not knowing a soul and left with a completely new understanding of who I was as a dancer and where I belonged in this magnificent world of music and movement. The beauty of three days dedicated to dance is that there is the opportunity to learn more than new steps. The instructors can deconstruct your dancing and open your mind to new concepts and techniques to improve your experience on the floor. My first class of the weekend centered on discovering your “dance identity.” Our teachers asked us to describe our dance style in a word. (That could be “playful” or “smooth” or “bouncy” or “fun” or “receptive,” for example.) As we made our way around the circle in class, each partner also wrote a word that described our dancing. Not only did the lesson make me more conscious of what my partner brought to each dance, but it brought some introspection. We all have great dancers that we idolize and try our best to emulate. No doubt, many of us have watched Whitey’s Lindy Hoppers or that one famous YouTube clip that made us all want to drop what we’re doing and learn aerials immediately. It’s important to remember, however, that we each bring something different to Lindy Hop. It would be a disservice if we didn’t allow our own flair and personality. That’s why we dance with different people! It is vital that, even as we try to learn that cool move or variation, we don’t shy away from letting our unique styles shine through. 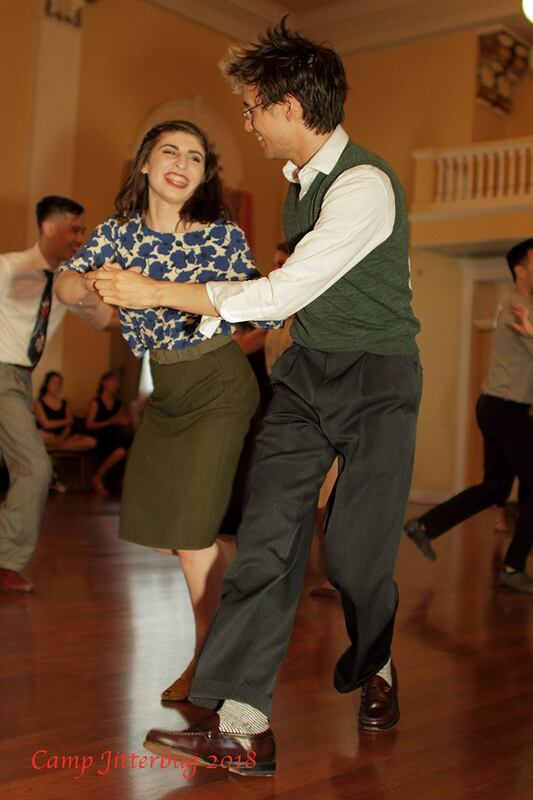 In fact, I learned this weekend, Lindy Hop is not really about the moves at all. Sure, it feels amazing when we sprinkle in something that makes our partner’s eyes pop. 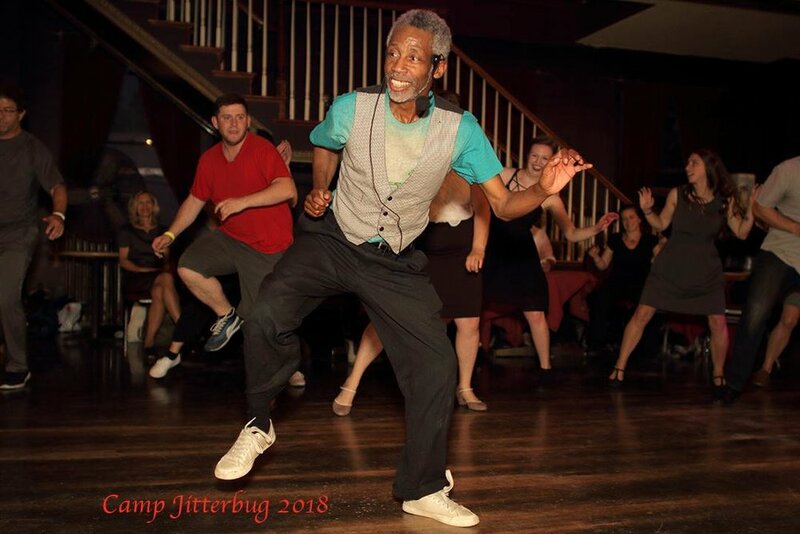 But more than anything, Camp Jitterbug taught me that the greatest joy is in the connection between two dancers, sharing a song and a love for the dance that bridges borders and generations. In a class with Evita Arce and (Aurora, CO’s own) Michael Jagger, we began by connecting with our partner and bouncing to the beat of a song. That’s it. Just bouncing. Sometimes, Evita pointed out, we get lost in a sea of moves. We forget the reason so many of us were attracted to Lindy to begin with: the joy of feeling a beat, identifying with a melody, and sharing that joy with another person. That simple, joint experience can be just as enjoyable. During my 72 hours in Seattle, I was fortunate to share smiles on the dance floor with so many men and women. Some were beginners. Some dropped my jaw in Camp Jitterbug’s outstanding competitions. But when heeding Michael’s advice (“It’s not about how many moves you know, it’s about doing the moves you know well.”), I realized that I got just as much of a rush when a partner followed simple steps forward and back as when a partner followed something I didn’t even know I was capable of leading. Camp Jitterbug taught me to trust myself. Trust what I have learned, yes, but also trust my love for this music, this culture, and this community. Freeing myself from “getting it right” allows me to enjoy the moment – the bizarrely intimate experience of connecting with a total stranger and creating something artistic, beautiful, and mutually joyous. I left Seattle feeling tired, but inspired: totally enamored by this community I was so lucky to find and more excited than ever to come back and create more special moments on the dance floor.